Chateau Gaudrelle is owned by fifth generation winemaker Alexandre Monmousseau. Alexandre's father, Armand Monmousseau, is the former head of his family's sparkling wine firm in Montrichard. Alexandre, intense and confident, received his schooling in Beaune and is one of the leaders of the Sec-Tendre (soft-dry) movement that includes producers like Huet and Champalou..
Monmousseau also produces Kysela's famous Vouvray, Clos le Vigneau. Today the Monmousseau family farms 14 hectares (34.6 acres) of land: 6 hectares for Clos le Vigneau, 8 hectares for Château Gaudrelle. 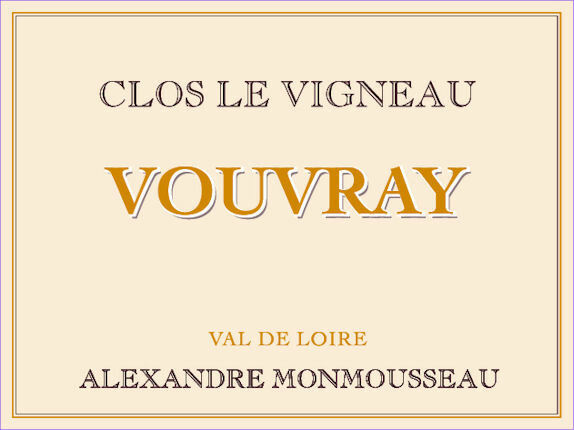 Clos Le Vigneau is a single vineyard from an area known as “les Gués d'Amant” or “Lover’s Gap”. Most of the vines were planted in 1929. The soil is a mixture of argilo-calcaire, silex and gravel. Alexandre Monmousseau believes in low yields for concentration and flavor. The grapes are hand harvested. Pressing is long and slow, fermentation is in stainless steel with two rackings and a light filtration before bottling.